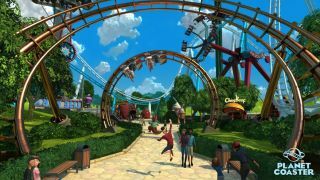 Last night's livestream with Planet Coaster's art director John Laws was a series of improbable statements somehow accompanied by footage to back them up. From earlier videos, I had some idea that Frontier's new theme park sim, a spiritual successor to RollerCoaster Tycoon 3, was rich with detail and flexible in the extreme—see here for a clip of coaster tracks being deformed every which way you please. Laws' discussion of themes took 'rich' and made it 'obsessive'. I'm a builder more than a manager: in any given game, I'm not so fussed how well my theme park/city/empire is doing as how neat and pretty it looks. In Planet Coaster, you start with a broad theme, as befits a gaudy tourist attraction: pirates, fairytale or ultra-modern, to name a few. In most sims, that would grant you access to a specific set of prefab assets. Here you develop a palette, select your signage and decide which potion bottles you want on display in your fairytale gift shop before dotting appropriate signs around the park to brainwash punters into buying your tat. Live the brand manager dream! Around hat shops, visitors can be spotted wearing more hats. People stagger around attempting not to wet themselves because you've built too few toilets. Reflections will play off every surface—an astounding level of fidelity for a sim. The VoD is over an hour long, but highlights include the announcement of themes and mascots itself, some concept art for coming themes that details the modular aspect of construction and one, two, three good chunks of in-game footage.